Pretty much same as prior years. 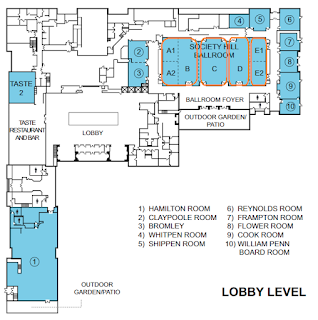 The registration area is located to the left of the entrance to the exhibit hall and the email kiosk/wifi area/ask-the-expert section to the right of the entrance. Once again they give you a card when you register that you use when you go to a different section of the registration area to pick up your course material. They've got the same bean bag chairs as prior years, and the same logo stands they've used for the last couple of years. Couple of things about the email kiosks though. First of all, it takes you directly to a login page for the online session scheduling application. Unlike prior years, it looks like the kiosks have been locked down a bit. Also, there's a link on the scheduling page for the techwave forums. However, when you go there you have to login again, and there are different login credentials for it than what you used for the scheduling page. Some better integration could have been done here. This year's bag is a bit different. It's a bit military looking, and there's a tag attached that indicates that 5% of the revenues from the sales of the bags when to Fisher House, an organization that provide services for families of injured military personnel. I'm familiar with their program largely because of Soldier's Angels, and have a great respect for both programs. The affinity pins are back, but they're no larger than they were before.